Architects often criticize the ugly, boring and flat drawings produced by Revit. It is a legitimate criticism. The out-of-the-box line weights settings are bad, and they are not easy to customize. The goal of this post is to teach you everything you need to know to adjust all the line weights options in your projects, giving you the power to create the best lines hierarchy in town. Click on “Additional Settings” in the Manage tab. Select Line Weights. This is where you will assign a thickness value to each number. 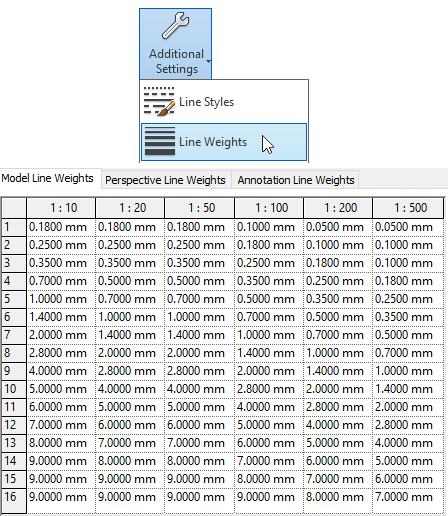 In the Model Line category, you can assign a different thickness for different scales. In some cases, it is better to remove this option and use the same thickness for all scale. When viewing a Revit model on a computer screen, the thickness of elements is dynamic. That means elements will appear to be thicker when you are zoomed in and thiner when you are zoomed out. That is the opposite of a printed document, where the thickness never changes. That is why changing the scale of a view from 1:100 to 1:200 will make all elements appear much thicker on your screen, while in reality, the elements are twice as small on a sheet of paper. To reduce the confusion of this effect, consult views when placed on a sheet. The title block will help to contextualize the scale and thickness of elements. To properly test out your settings, you will need to print the drawings using the correct scale. That means avoiding print screen or the “Fit to page” print settings. Make sure to use Zoom 100% when printing. Once you set all the line weight thickness values you want to use, go to the Object Style menu located in the manage tab. You will have to set both a Projection and a Cut thickness value. Projection lines are seen from a distance. Cut lines are usually thicker and are used when an element intersect the cut plane of the view. Let’s start with the Wall category. As you see, there are subcategories such as Cornice where you can assign a different thickness value. You can also use this menu to specify a line color and pattern. In the image below, you can see a wall using the settings we’ve just applied in the Object Style menu. The 1 and 3 thickness numbers refer to the thickness values assigned in the Line Weights menu. In the test #3, we’ve reduced the thickness value of line weight 3 in the 1:200 scale to 0.30mm instead of 0.35mm. Using the combo of Object Style and Line Weights will affect all elements in all views. If want to modify the thickness of a category of elements in a specific view, you will have to use the Visibility Graphics menu. Use shortcut VG. Scroll down to the walls category. Click on the Override button for Cut Lines. This will make all walls thicker in the view where this override is applied. Since perspective views don’t use a scale, customize the thickness in the Line Weights menu. Make sure to place perspectives on sheets to properly gauge the thickness. For full control of line thickness hierarchy in perspectives , consider using tool such as Silhouettes and Linework. To adjust the thickness of annotation elements like sections marks, dimensions, generic annotations and tags, you will have to use the Annotation Line Weights menu. As you see below, modifying these values doesn’t affect model elements or detail lines. You just learned how to adjust the line weight of all annotation elements. You must also set a numerical value to each annotation element category in the Object Styles menu. Click on the Annotation Objects category. In the example below, we adjust the line weight of the generic annotation category, which affects our note bubble family. What if the effect of the Object Style menu is too broad for you? Below, we modify a note bubble generic annotation family. We create a custom “Bubble Thick Lines” in the object styles of the family and assign it to the masking region of the note bubble. We also add a small tail to the bubble that uses the “Bubble Thin Line” subcategory. Then, we save and insert the family into the project. Go back to the Object Style menu of the project. As you can see in the image below, the new custom “bubble” subcategories are added to the project. This way, you can adjust the line weight of the bubble generic annotation without affecting the line weight of the other generic annotation families. Another quick tip: the leader line weight is controlled by the Generic Annotation category. Sadly, this cannot be reassigned. You’ve just learned how to modify a loadable family and use the object style menu to properly control line weight. However, Revit also contains System Families which cannot be edited in the family editor. Such families include levels, grids, dimensions and many others. In the example below, we modify the type properties of a dimension. Both the Line Weight and the Tick Mark can be assigned to a specific line weight numerical value. When setting the pattern in a material properties, you don’t have the option to pick a line weight. That’s because all the weights are set to 1 and cannot be changed. There is an exception to this rule: a line weight can be assigned to a pattern when used in a Fill Region. The line weight of almost all elements can be customized. The ceiling pattern lines are an exception. The weight of ceilings is always 2­. That’s why ceiling patterns tends to be quite thick. There is no way to modify that thickness except by using the Line Weights menu. Most CAD files use a color system to assign a thickness. In the image below, you can see the typical color hierarchy. The problem is that by default, Revit will ignore the AutoCAD color system and set everything to the basic line weight 1. To fix the issue, go to the Insert tab and click on the small arrow below “Manage Images”. Below, you can see that the Line Weight in the default settings are all set to 1. Adjust the values to fit the DWG color number. When you re-import the DWG file, the lines thickness will match the Revit Line Weight settings. In some cases, you will work with a CAD file where a thickness is directly assigned to a layer instead of using the color code. When Revit import such a file, it will match the thickness of the CAD line to the closest value inside your Revit Line Weight setting. For example, a CAD line with a 0.30mm thickness will be assigned to Line Weight 3, which is 0.35mm. It is always possible to customize the line weight of all imported CAD layers. Go to the Object Styles menu, then to the Imported Objects tab. As you see below, you can reconfigure the weight, color and pattern of all CAD layers. This will affect all instances of the CAD file in the model. Want more tips? Download our free seasonal pamphlet PDF about Line Weights. You will learn advanced strategies to properly organize the line weights in your template.